This hillside vineyard is in the Anderson Valley, just inland from the redwood tree coastal range south of Mendocino, California. These lush grape vines thrive in the moisture of the early morning coastal fog and the brilliant afternoon sun every summer day. The rolling hills of this valley are covered with wineries, each inviting you to taste last year’s harvest and stay awhile to enjoy the view of the California golden hillsides covered with vines – a symphony in green and gold! 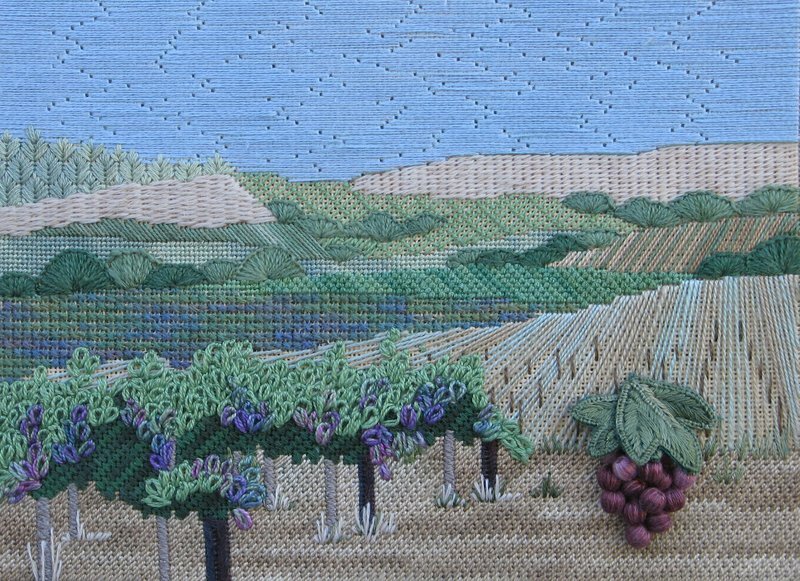 Hillside Vineyard interprets this lovely scene in canvas embroidery. I wanted to explore the illusion of movement and perspective through thread and stitch placement. The special challenge of this piece is differentiating the many hues and values of green by thread texture and stitch selection. An enjoyment and appreciation of the beauty of nature and natural forms is the motivating inspiration behind my designs. I use needlework to record memorable places and experiences much as others use travel journals, photo albums, and sketch books.